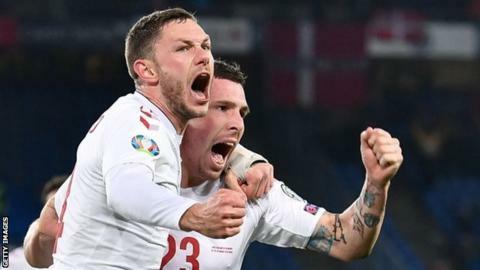 The Euro 2020 qualifiers began with a bang and - fittingly after an exciting week - ended with even more drama. Two incredible finishes took place simultaneously - one in Basel and one in Oslo - as 10 minutes of madness produced six goals and two 3-3 draws. Denmark fought back from 3-0 down to draw in Switzerland, while a see-saw game in Norway ended with the hosts also nabbing a point against neighbours Sweden. Switzerland must have been confident of earning a second win from their two Euro 2020 qualifiers after Remo Freuler, Arsenal midfielder Granit Xhaka and Breel Embolo put them into a commanding 3-0 lead with little over 15 minutes to play. Even when Denmark defender Mathias Jorgensen ghosted in round the back of a sleepy Swiss defence to head in, it appeared likely to be of little consequence. Trailing 2-0 after an hour in Oslo, Sweden gave themselves a lifeline when Viktor Claesson made it 2-1 after 70 minutes - and then, with four minutes left, Robin Quaison's shot took a wicked deflection off Norway defender Haavard Nordtveit. ...back in Oslo, things got even better for the visitors. As the clock ticked past 90 minutes, Quaison steered in Claesson's pass to put the Swedes ahead for the first time in the match. By now, the Swiss were rocking. With plenty of bodies in the home box, the defence could not head clear a high ball and Brentford's Henrik Dalsgaard took advantage of the panic to leap above flapping Swiss keeper Yann Sommer and nod in an equaliser. ... but the evening's drama did not end there. Deep into stoppage time, with the Swedes begging for the final whistle, Real Madrid youngster Martin Odegaard took a last-gasp corner for Norway. Substitute Ola Kamara rose to meet the delivery and nod in a late equaliser which sent the majority of a packed Ullevaal Stadion into raptures.